The plans have been deferred to a future planning committee meeting. 'Picture: Town Pix. Harrogate Town AFC fans now face a longer wait for a verdict on the club’s major development plans, after discussions at Harrogate Borough Council’s (HBC) planning committee meeting on Tuesday. Members agreed to defer Harrogate Town’s application to a future committee meeting, to allow time for the concerns of some residents to be considered in more detail, alongside an environmental report. The club’s plans include building a clubhouse, extending their family stand, having new seated terraces and floodlighting, and securing retrospective consent to retain their artificial 3G pitch. Club chairman Irving Weaver said the 3G pitch has already made a big difference to the community, and urged councillors to back the development plans. Mr Weaver said: “Since being involved over six years, we have improved every aspect of the football club, and that is a result of a very positive response from the community. “One of the great pluses of the 3G surface is that we can always hold football on the pitch. That’s given us the opportunity to invite the community into the club, and to give them community use. 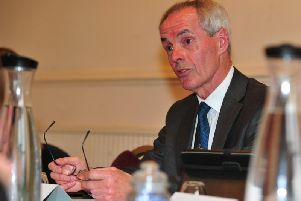 Living on nearby St Nicholas Road, Mike Edward raised concerns about parking, noise and the hours that pitches are being used at the stadium. He said: “There has been an adverse effect on quality of life since a 3G pitch was installed, specifically in the areas of noise, lights and traffic. Mr Weaver said the club continues to be committed to taking on board and acting on the concerns of residents, and said a lot of consultation has already been carried out around parking and other issues that have been raised. Managing director Garry Plant said the development plans would help to continue and expand on the delivery of a raft of activities that the club already delivers for the community.